As we gain a deeper understanding of the ininīmowin, we find the history, the teachings, and the world view of the inino embedded in the words. As an oral language, this ensures the continuation of the culture from one generation to the next. 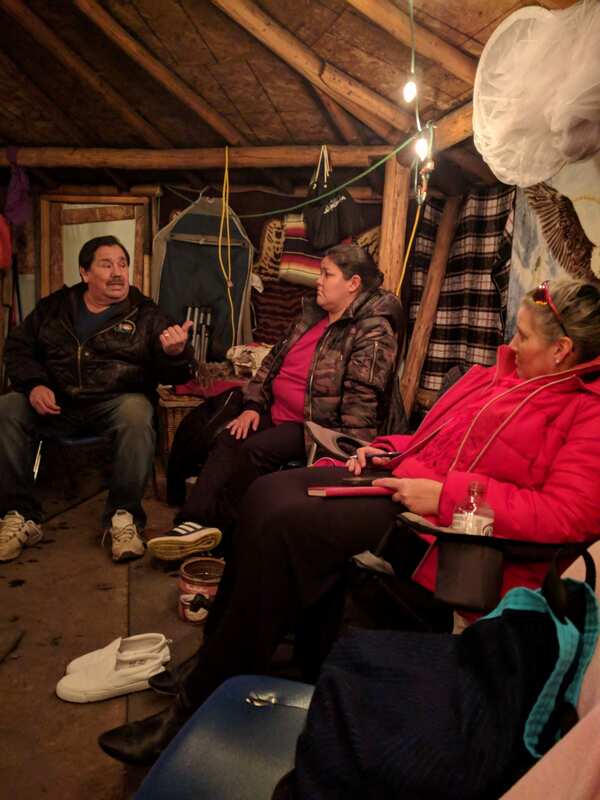 The Elders are telling us that we can’t just translate our language into English; we have to look more closely in order to better understand our ininīwin. In this session, we will examine concepts of child raising and education based on words in ininīmowin and explain the history and teachings that are contained within each word. Ron Cook was a fisherman on Lake Winnipeg for 15 years and lived a traditional lifestyle with his wife and five daughters. In 1992, his interest in his first language (nehinawewin) inspired him to enter BUNTEP when they offered a program for training Native Language teachers, graduating in 1997 with great distinction. He taught Cree at Grand Rapids School for five years before he moved to Thompson to teach at Wapanohk Community School in the Cree bilingual program. He was the Cree Language/Indigenous Perspectives Coordinator for the School District of Mystery Lake from September 2006 until he retired in June 2018. He is currently the consultant for the Centre for Aboriginal Langauge and Culture at the University College of the North. Red River College’s inaugural Indigenous Culinary Skills program is cooking up opportunities for students and re-opening the doors to the College’s Prairie Lights restaurant at the Notre Dame Campus. The College’s first-ever pop-up short order restaurant will see this inaugural group of students cooking made-from-scratch breakfast and lunch starting March 12th to April 17th, with a menu featuring a new take on some delicious Indigenous dishes. “A key priority for the College is to advance Indigenous achievement and elevate student success. 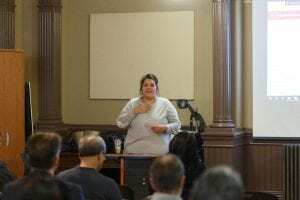 Our role as a college is to ensure we create the programs, supports and opportunities that allow Indigenous peoples to demonstrate their leadership and innovation in all facets of our society,” said Rebecca Chartrand, Executive Director, Indigenous Strategy. The students will operate the restaurant as a real short order kitchen, which won’t only give students practical experience that they can use when they enter the workforce but it will also touch on power skills like team work, communication, time management and problem solving. This initiative demonstrates the College’s commitment to support Indigenous learners on their journey towards education and successful employment as well as growing Indigenous peoples successfully into all industries. The restaurant will also give employment experience to students enrolled in College Transition, a one-year exploratory certificate program. The College has hired these students to run the “front-of-house” operation and as part of their new role also received First-Aid Training and their Food Handler’s certification. The Prairie Lights restaurant will be open to the public from March 12th to April 17th and offers made-from-scratch breakfast, lunch and daily specials. Hours of operation are Tuesday through Friday; 9 am to 10:30 am for breakfast, and 11 am to 12:30 for lunch. Seating is limited and is first-come, first-served. 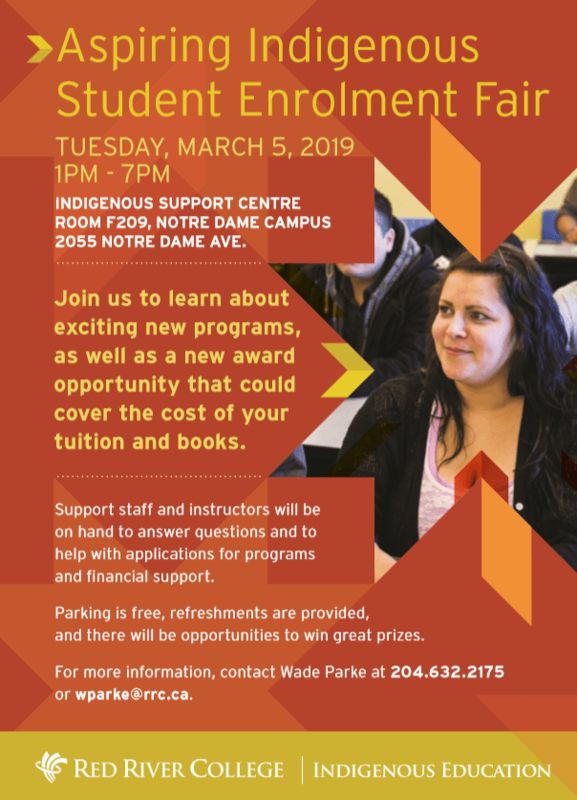 Please join us for Red River College’s Aspiring Indigenous Student Enrolment Fair to learn about exciting new programs, as well as a new award opportunity that could cover the cost of your tuition and books. Red River College, Indigenous Education is pleased to announce the creation of the one million dollar Building Brighter Futures: Bursaries, Scholarships, and Awards in partnership with Indspire. This is our demonstrated commitment to Indigenous Achievement at Red River College and to the Truth and Reconciliation Commission of Canada Calls to Action. The first deadline to apply is March 15, 2019 for programs that start in September of 2019. We encourage aspiring students to apply early as funds will be distributed on a first-come first-serve basis. Must meet admission requirements for their chosen program. 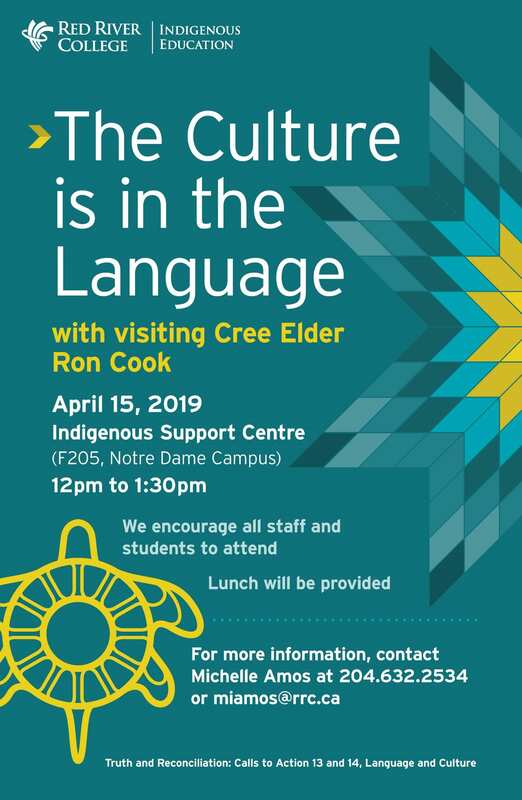 For more information please contact Wade Parke, Indigenous Education Aspiring Student Manager, at 204-632-2175 or email: wparke@rrc.ca. On behalf of the School of Indigenous Education, we are pleased to host the 19th Annual Pow Wow honouring Indigenous graduates on Friday, May 3, 2019 at the Notre Dame Campus (2055 Notre Dame Ave.) in the North Gym. Dancers, drum groups and community members are welcome to attend. Crafters please contact the Pow Wow Coordinator to book a table. Free parking is available in the parking lot labelled West 4 (see map). We hope you will join us in honouring our students as we send them off on a continued journey to success. Should you have any questions, please contact Morgan Paul at 204-632-3773 or email mpaul50@rrc.ca. Indigenous students who are graduating from a Red River College program in 2019 can register to be honoured at the 19th Annual Pow Wow Honouring Indigenous Graduates on Friday, May 3, 2019. 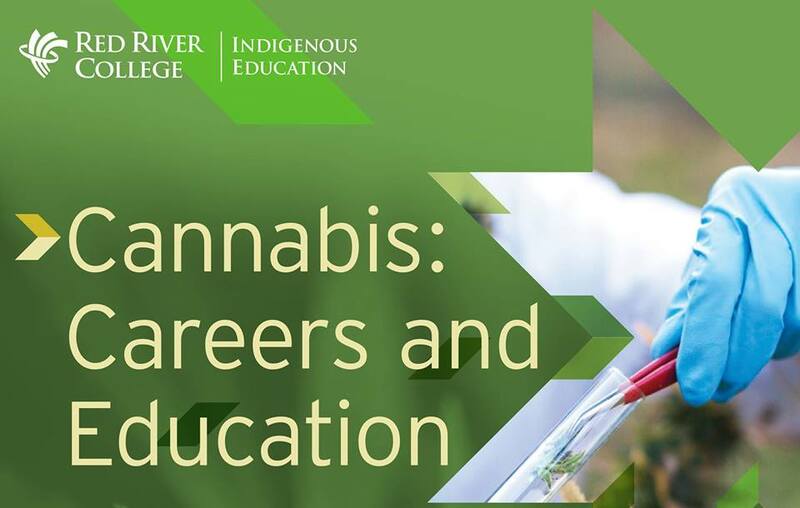 Industry representatives are coming together for a one-day Careers and Education in Cannabis job fair at Red River College’s Notre Dame Campus in the Indigenous Support Centre on Monday, January 14 from 2:00 pm – 7:00 pm. 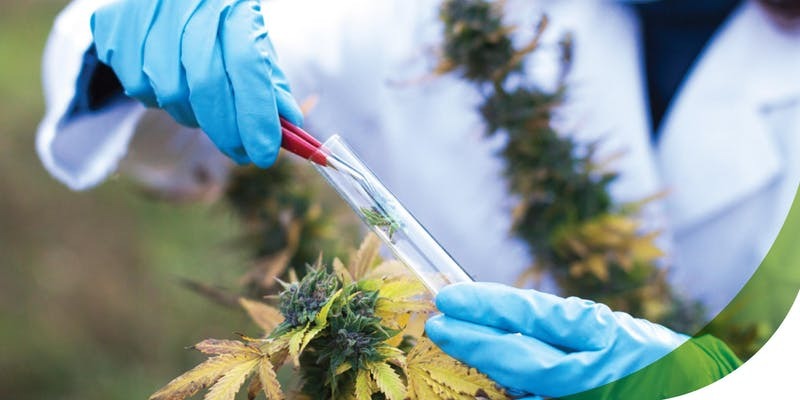 Following the sold-out inaugural Cannabis 101 Course this fall – the first of its kind to be offered by a post-secondary institution in the province, and one of few available across the prairies – Careers and Education in Cannabis invites alumni, prospective students and those with an interest in the industry to explore career options, submit resumes for retail positions, and apply for bursaries as well as the Winter 2019 Cannabis 101 Course. “A key priority for the College is to strengthen our partnerships and continue to advance Indigenous achievement in our communities; and within that, one of the main areas of focus in Indigenous Education at Red River is the transition to employment once a student graduates from one of our programs. It’s vital that we provide supports and opportunities that allow our grads to take the next step in their life journey. 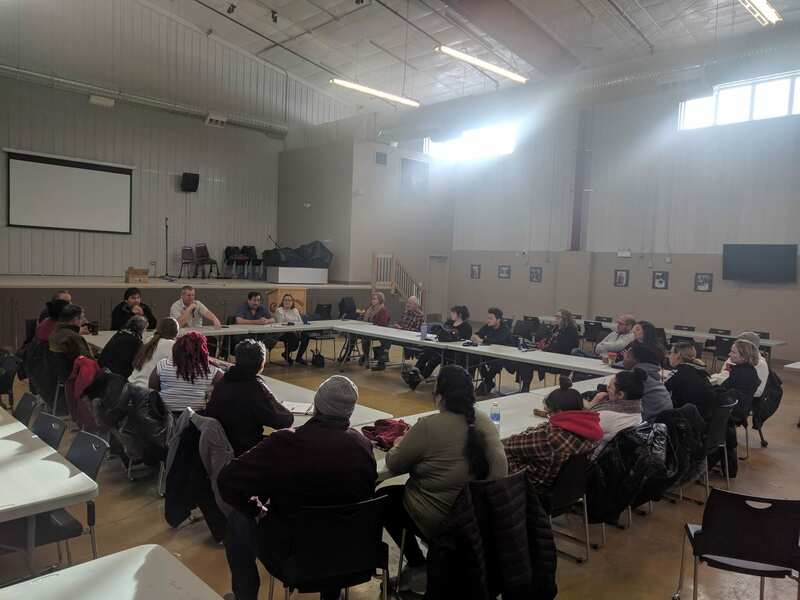 This day of career exploration is just one example of how we are addressing employment, entrepreneurship and Indigenous growth and participation in the cannabis and hemp industry,” said Rebecca Chartrand, Executive Director, Indigenous Strategy. Local companies Garden Variety, Tokyo Smoke, and Delta 9 Cannabis will be on site to network, answer questions, and take applications. RRC continues its relationship with Indspire Brighter Futures, which provided 56 students with bursaries for tuition fees and books in fall 2018. Indspire is a national Indigenous-led registered charity that invests in the education of Indigenous people and are providing 29 bursaries for Indigenous learners for RRC’s Winter 2019 term. The one-stop-shop Careers and Education in Cannabis event will provide access to the computer lab so attendees can apply for bursaries on site and speak with RRC staff. Refreshments will be served. Please contact Frank Parkes at fparkes@rrc.ca or 204-632-2534 for more information and to reserve parking. Please note, this event is 19+ due to LGCA regulations. Paul Vogt, President and CEO, Red River College, greeting students, staff and industry guests. 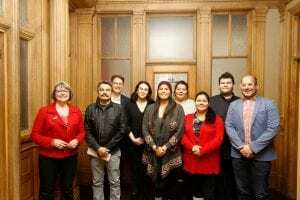 On Friday, December 14, the inaugural class of Red River College’s Indigenous Social Enterprise hosted industry partners, including leaders from Manitoba’s successful and emerging social enterprises, to introduce them to RRC’s newest two-year diploma program. 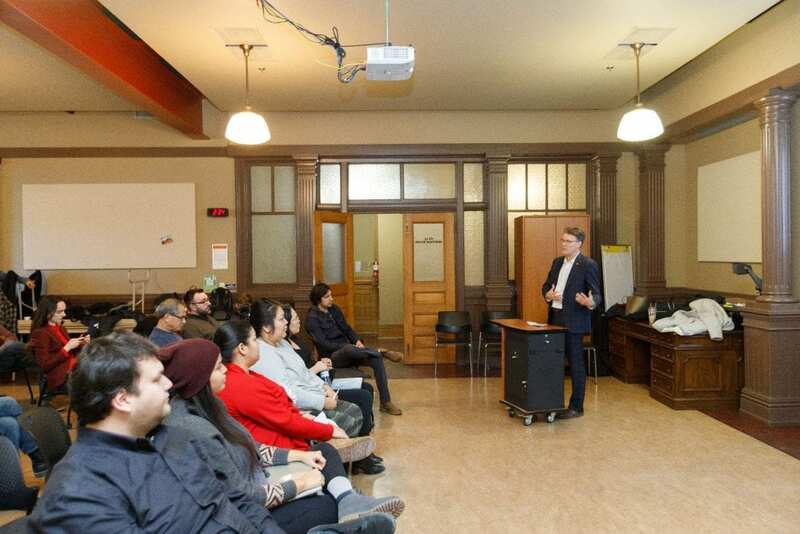 The centrepiece of the event was unveiling the Social Enterprise Map students created over the first term to identify the social enterprise ecosystem in Manitoba. Each student had the opportunity to present a specific social enterprise in each of the main categories. Student Courtney Clemons, whose spirit name is White Thunder Cloud Woman, presented on Fisher River Economic Development Corporation (FRED). Social Enterprise is one of the five new programs launched this fall for Indigenous learners that aim to grow Indigenous representation and assist RRC in continuing its strategic priority to advance Indigenous achievement at the College. Indigenous Social Enterprise students, instructors and Paul Vogt. This two-year diploma introduces students to a multitude of for-profit, non-profit, and co-operatively structured social enterprises addressing today’s most pressing issues. Students work alongside social-enterprises here in Manitoba to gain the right hands-on experience to understand what it takes to work on these environmental, social, cultural, and spiritual needs. Students will also experience first-hand how their work can have an impact on addressing a variety of societal challenges that exist in many urban and rural communities. At the end of the program each student will have an opportunity to incubate their own social enterprise idea and then launch it upon graduation. Learn more about the Indigenous Social Enterprise program. We sat down with Elder-in-Residence Paul Guimond, who will lead the Winter Solstice ceremony at the Notre Dame Campus, to learn more about this key seasonal event. Both Red River College Indigenous Support Centres (Exchange District Campus and Notre Dame Campus) will host Winter Solstice celebrations to mark the start of the season, December 13th and 14th, and you’re invited! Gatherings for the Winter Solstice bring comfort, warmth, and people together to share stories, laughter and of course, food. In Indigenous culture, winter represents an ancestral spirit, so reflecting on the past by sharing stories and thanking our ancestors is an important part of honouring where we’re from, especially as we plan for the cold months ahead. We’ll begin with a traditional pipe ceremony and sacred songs, one of which will be a thank you song to our ancestors. Don’t worry if you don’t know the words, lyrics will be shared so everyone can join in. At the Notre Dame location, we will bring a grandfather drum to life. Both events will conclude with a feast that Paul says represents feasting the spirits and showing thanks. The Winter Solstice celebrations offer RRC students and staff an opportunity to learn more about and participate in the Indigenous ceremonies that take place at the college, visit the Support Centres, and meet staff. All pipe carriers are invited to take part in the Pipe Ceremony. Indigenous Education does not start in the classroom. It starts in connecting students to the real world, whether that be the traditional world or the academic world. It allows students to be successful in whatever path they choose to take in life, whether that means employment in an urban centre or returning back to their community to work on community driven projects. Although traditional Indigenous people did not carry around beakers and journals, they were scientists. They understood and followed Natural Law. They understood and had biologists, chemists, archeologists, and botanists. They also understood and used astrology, and practiced conservation and land management. Often people hear the word traditional and they think that the information is outdated or not scientifically sound, however, the reality is that Indigenous knowledge and ways of being provide us with many of our modern medicines and knowledge of our physical environment. The form of tanning that the students learned does not use chemicals but rather parts of the animal. It’s important to understand that there may be quicker methods to tanning but they are harmful to the earth and to the humans working in that field. These students now have the knowledge to tan a hide, take care of the earth and themselves for future generations. 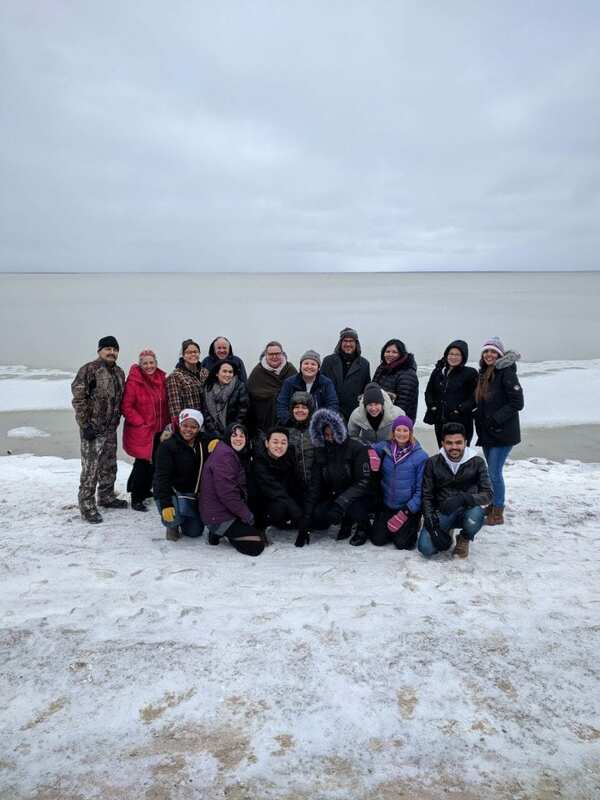 On November 7th and 8th, 25 students and instructors from Red River College’s Indigenous Education went to Fisher River Cree Nation to learn about the Initiatives the community has undertaken regarding Community Development, Economic Development and Social Entrepreneurship. 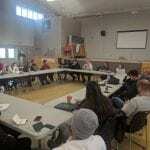 The community facilitated discussion with community leaders who ensure that environmental stewardship, sustainability and cultural values are integrated into all aspects of community life. Chief Crate and Council members spent time with the students explaining how they achieve and maintain a healthy community and environment by describing initiatives, research, land management and governance structures that support the ongoing resilience of the community despite the colonial imposition of the Indian Act and other policies that historically have sought to diminish these very values. 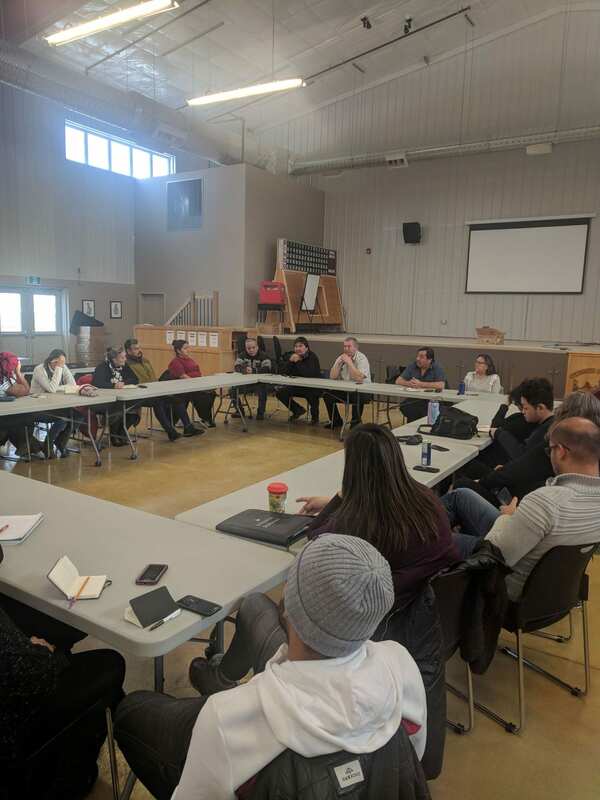 The students and instructors then embarked on an extensive tour led by one of the council members of the community to numerous locations of interest including the cottage lot development, the largest solar farm in Western Canada, the new community hall, the band office and the high school. The school is new and incorporates geothermal heating (as do most homes and buildings) and sustainability into the design. It also highlights the Cree cultural and language ways of learning through Artwork, Architecture and programs. Some programs include land based teachings of hunting and trapping, Cree language integration into curriculum and an access life program that prepares students for success into life after high school into post-secondary opportunities, entrepreneurship or other types of success. 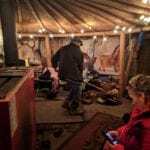 The evening was hosted by council member Carl and his wife Jeannie who prepared a sweat lodge ceremony. The group is diverse and includes students who are of Indigenous, non-Indigenous and International decent. 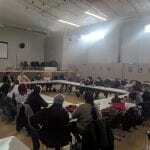 The experience for most was the first time experiencing Cree ceremony, medicines, songs and drumming. 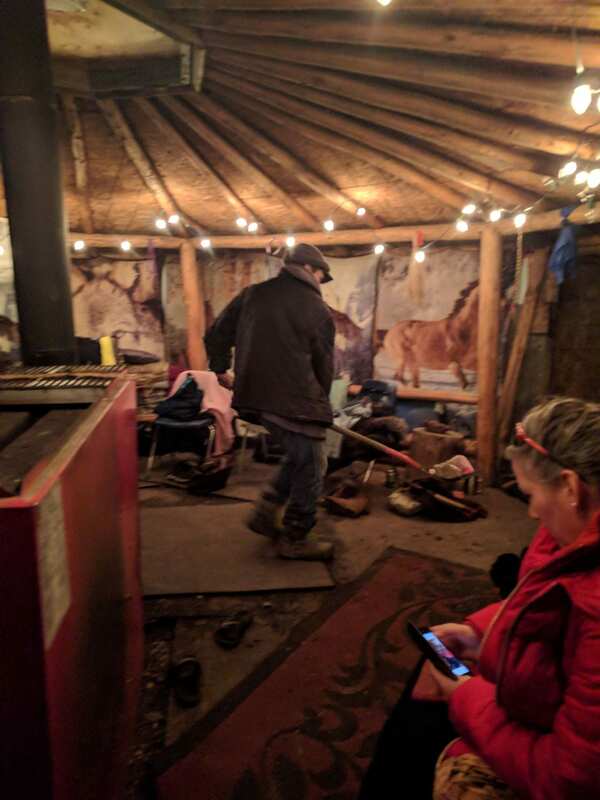 The field trip ended with a sharing circle and honour song led by Elder Jeanie and delivered with traditional drum playing and singing by a talented young man who brought some of the group to tears with his song. Red River College is extremely grateful for the opportunity to visit and connect with FRCN and for the generous hospitality, language and cultural teachings, delicious food and history books they received. Red River College’s School of Indigenous Education welcomes you to a one-day Cannabis Day Conference on October 19. Join us for a day of learning, opportunity and networking with panel speakers that include Industry experts from Navigator, Bonify and National Access Canada, including Medical Professionals doctors and patients, educators, investors, and entrepreneurs as well as provincial and federal regulators. With Canada set to become the first G7 country to have full legalization on both medical and recreational use of cannabis, education, research and development will play a significant role in this emerging industry. Come learn this growing Cannabis Industry In Manitoba including upcoming courses at Red River College and the growing partnership opportunities with First Nations and Métis Nations. To register, please sign up on Eventbrite. For questions, please contact Morgan Paul at mpaul50@rrc.ca or 204-632-3773. Red River College is also offering a Continuing Education night course starting November 6 called Cannabis 101.
robust discussion on the safety and social responsibility topics in the industry; and. It’s important to self-declare because Red River College strives to create an environment that reflects the diversity of the population we serve. Declaring your Indigenous status allows us to send you information and opportunity listings you might not hear about otherwise.